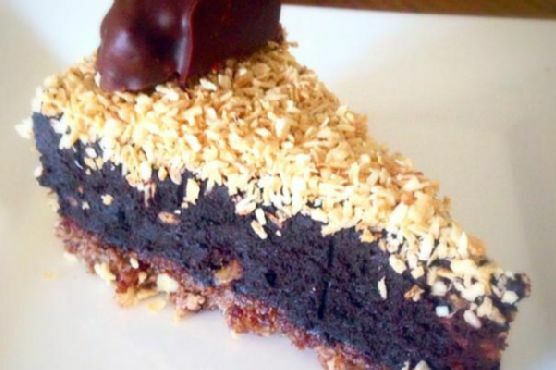 No-bake Toasted Coconut Chocolate Cake with Chocolate Macaroon Cookies might be just the dessert you are searching for. This recipe makes 10 servings with 511 calories, 5g of protein, and 41g of fat each. For $1.95 per serving, this recipe covers 15% of your daily requirements of vitamins and minerals. If you have coconut, carob powder, tsp vanillan extract, and a few other ingredients on hand, you can make it. 2 people have tried and liked this recipe. It is a good option if you're following a gluten free and dairy free diet. From preparation to the plate, this recipe takes about 45 minutes. All things considered, we decided this recipe deserves a spoonacular score of 45%. This score is solid. Try Flourless Bitter Lime Coconut Macaroon Cake with White Chocolate Whipped Cream, Dark Chocolate Macaroon Toasted Almond Butter, and Toasted Coconut Chocolate Chunk Cookies for similar recipes. CRUST: Soak nuts if desired, for 1 hour or longer. Mix nuts and dates into a blender or food processor and pulse until chopped. Press into pan, and place into the fridge while you prepare the filling. Combine the carob powder, avocados, maple syrup, and coconut oil into a food processor or blender until completely smooth. Pour onto cake crust, and place back into the fridge overnight (or a minimum of a few hours). TOPPING: Sprinkle toasted coconut evenly over cake. Combine the rest of the coconut, vanilla, and almond or peanut butter in bowl, and mix. Roll into small balls and flatten on cookie sheet. Cool and then place into freezer. Melt 3 tbsp chocolate chips with 1 tsp coconut oil. Dip cookies into melted chocolate and place back into freezer for 10 minutes. Cut cookies in half, and lightly press into cake, around the edge, so each slice gets one. Read the labels when buying peanut butter. To choose the healthiest peanut butter, look for a brand without too much added fat, sugar, or salt. If you buy a natural brand that requires extra stirring due to oil separation, store the jar upside down or on its side to make the task a little easier. If you're allergic to peanuts or nuts, you can substitute sunflower butter for nut butters in many recipes. If you're following a vegan diet (or avoiding dairy), make sure the brand of chocolate chips you buy is suitable for your diet! Always read the labels carefully. If you cannot find chocolate chips free from milk or other dairy in stores near you, look online. If you really want to benefit from chocolate's health benefits, use cacao nibs instead of chocolate chips. They are much less processed than chocolate chips and have no added sugar! Avocados are one of the "clean fifteen", so you don't have to buy them organic if you don't want to spend the extra dough. If you're buying an avocado to use for dinner tonight, make sure you choose a ripe one! Find an avocado that is soft enough to press your fingertips into. If it's too firm, it's not ripe. If it's almost smooshy, it's too ripe. The perfect avocado can be hard to find in stores, so you might have to buy your avocados in advance and ripen them at home. To speed up the ripening process, put the avocados in a paper bag with an apple or banana. It really works! Maple syrup comes in three grades, either A-C or 1-3 depending on where you live. To learn which types are suitable for which uses in the kitchen, check out our lesson on maple syrup in the academy.